This issue opens with “Destroyer Down – Episode III: Protect” which is the last part of the story. 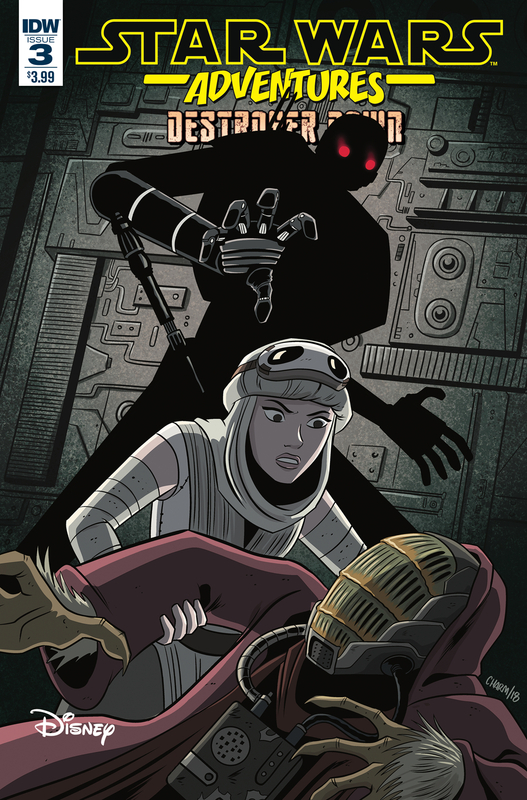 In it, Rey has to escape a Imperial droid like K-2SO, and ends up saving Sarko Plank’s life. The art style is big and bright and very pleasant. Plus the story has a good ending. It’s a nice end for the story. However, the issue goes on from there with “The Ghost Ship – Part 3: Gravity Matters.” In this one, the Rebel pilot takes down the ghost ship with the help of his droid. The Imperial admiral abandons ship, and the Rebel fleet arrives above Jakku. The highlight of the story is the Stormtroopers talking amongst themselves about the Rebel pilot’s threats. It’s pretty funny. The story ends with a tease that this is “Just the beginning” but that might just be because the story continues with the “Destroyer Down” stories that have been presented in parallel. Regardless, the artwork is fun and cartoony and the story isn’t too bad. Overall, a fun issue. I give it a three out of five baby nexus.